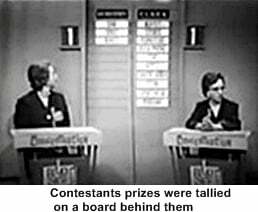 It was not the habit of networks to transfer game shows on to video tape so that they could be saved or packaged for release. A few bootlegged copies are floating around but there are no commercial copies available. 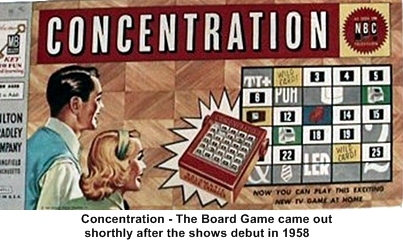 This was a game show that required you to remember what was shown on each square of a larger game board consisting of thirty squares. Two players, in turn, called out a pair of numbers (from one to thirty), which appeared on a three-sided wedge on a game board. If the prizes (or information such as “wild card” or “take one gift”) matched, the player was credited with the prize. 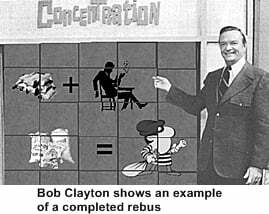 The third part of the wedge was shown when a match was made, and revealed two portions of a slowly building rebus puzzle (a picture-gram for those of us that don’t know what a rebus is). The player was given a chance to guess the answer and if correct, they won the game and all prizes credited to them. If not, they called out two more numbers and tried to make another match. When the player failed to make a match, the turn then went to the opposing player. The winning player would then play against another challenger until defeated or winning twenty games. Besides the regular prize squares there were six special squares. There were two ‘Wild Cards’ (would match to any prize square that the contestant choose), two ‘Take One Gift’ (if matched allowed you to steal a gift from your opponents winnings), and two ‘Forfeit One Gift’ (if matched you had to give a gift to your opponent). 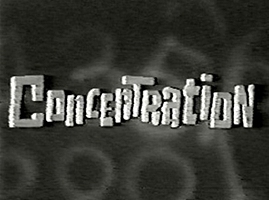 Concentration had little competition from other shows in its time slot but in 1972 “The New Price Is Right” debuted opposite it and promptly took a large share of its market. By the end of 1973 the producers felt that the show had a good run for fifteen years and decided to end it. 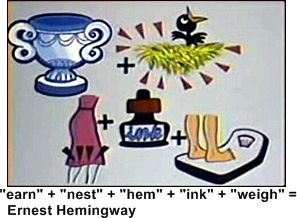 The last puzzle rebus spelled out “You’ve Been More Than Kind”. Hugh Downs was a busy guy in the ’50s and ’60s.